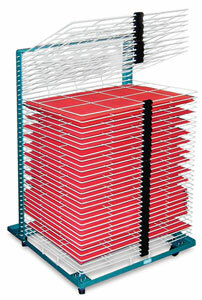 This durable, steel drying rack includes space bumpers that maintain parallel spacing in up and down positions. It maintains its up-angle pivotal position without the use of springs. The unit rests on ball-bearing swivel casters for easy portability.